When Peter Saghegyi lost his position at gaming developer Rockstar Vienna, the Hungarian native decided it was time for a change. He headed to London, and then ended up in Dubai, one of the more influential United Arab Emirates. He spent the boom years (2006-2008) trying to sell real estate visualizations to companies in the city, and later joined a branding agency to build an interactive content team from friends he had worked with at Rockstar. Unfortunately, that’s when the bust happened, and opportunities in Dubai became scarce. As they had nothing to lose, the group decided to create a game about the city they now lived in. The information about the city is highly censored, but Saghegyi feels that there is another tradition of openness from the rule of the Sheikhs since the 1900s. He feels that the city itself gets a bad rap, and wanted to change that perception. 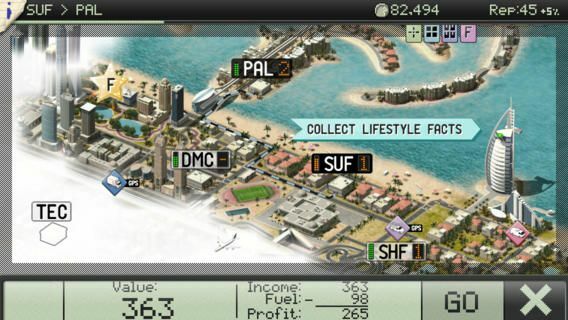 The resulting game, Dubai Delivery, puts players in charge of a Dubai-based parcel delivery company. Over time, as they deliver packages in and around the city map, they’ll learn more about Dubai’s history and current lifestyle, as told by real Dubai residents. Here’s the launch trailer to give a better sense of the game itself. The idea for Dubai Delivery came from the team’s very real daily frustrations. Many local agencies came to the team looking for copies of ideas they’d seen on the internet, ideas from overseas. Saghegyi and his team wanted to show that original content could happen in Dubai, as well. Using their own money, they spent 6 months creating Dubai Delivery. The game itself is free and offers a perspective not seen often in Western media, especially in games. It also looks like a pretty sweet delivery/puzzle sim, as well. Give it a download today and let us know what you think.